After the fall of the Roman Empire in Italy, several cities formed independent states. Venice and Florence were such cities. And these two centers of power and wealth became the cradle of the Renaissance. Venice is a city on a group of islands on the northeastern edge of the Italian peninsula. Shipbuilding was the primary industry in Venice. During the Crusades, Venetian ships provided transportation to the Holy Land. By the 13th century, Venice was the most prosperous city in Europe. The city became rich by collecting taxes on all merchandise brought into its harbor. Using this source of income, Venice built huge warships that protected the valuable cargo of its merchant ships from pirate raids. With the vast wealth from trade, many of the leading families of Venice vied against one another to build the finest palaces or support the work of the greatest artists. Florence is situated in the hill country of north-central Italy. Roman dictator Lucius Cornelius Sulla founded the city in 80bce as a home for his loyal soldiers. One source of Florentine prosperity was the processing of wool from sheep raised in the rocky, hilly country of central Italy. The wealth from wool processing and other industries made Florence a leading center of commerce and banking. One family, the Medici, dominated the culture and government of Florence for centuries. Wealthy merchants in Venice, Florence, and other Italian city-states demonstrated their wealth by building grand palaces for themselves. The merchants became patrons of artists who filled their homes with beautiful paintings and sculptures. Patrons bought rare books and paid scholars to teach their children. The money and encouragement of patrons, together with that of the Christian church, made the masterpieces of Renaissance art possible. The Torre del Mangia of the Tuscany region of Italy was constructed during the fourteenth century. The tower built to the exact height as the Siena Cathedral as a sign that church and state had equal influence over the region. 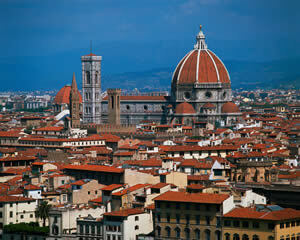 Present day Florence is the capital city and most populated city of the Italian region of Tuscany. More than 1.5 million people live in the Florence metropolitan area.